This 3 bedroom villa with swimming pool is located in Protaras and sleeps 6 people. It has WiFi, barbeque facilities and parking nearby. 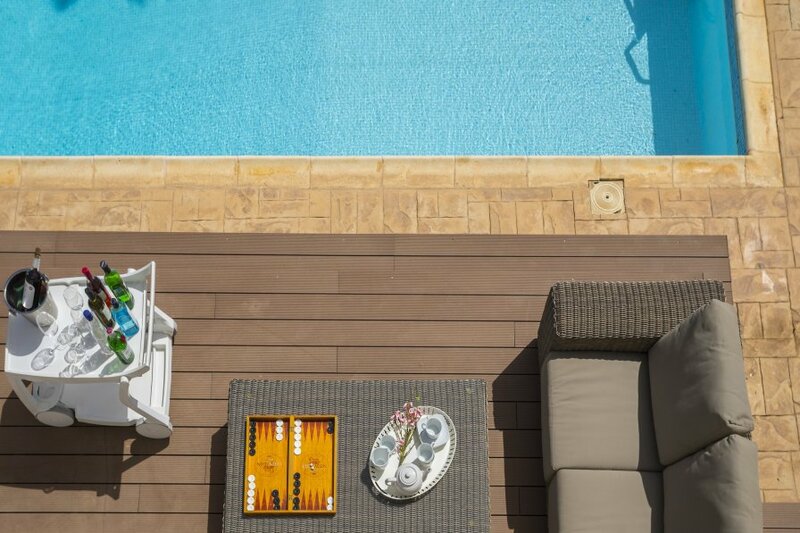 Protaras Holiday Villa Sea Star is a fabulous 3-bedroom villa with large private pool and partial sea views. Built on 2 levels and with a furnished roof garden the villa is spacious inside and out and decorated with care to make this beautiful villa into a home-away-from-home. The ground floor offers a fully equipped kitchen, dining area and living room that open to the outside patio featuring a large private overflow pool, comfortable sunbeds, parasol, dining table and BBQ. On this level there is also a guest toilet and an outside shower to service the pool. The upper floor features three bedrooms, two double and one twin as well as a family bath room. Two of the rooms offer good sea views. The roof top with excellent sea views is accessible from the upper floor of the villa. Protaras Holiday Villa Sea Star is fully air-conditioned and offers high speed private Wi-Fi internet, satellite TV, all modern kitchen appliances and a BBQ. Neighborhood Situated on a quiet tranquil location of Cape Greco, Villa Sea Star is only a 5-minutes’ drive from the centre of Protaras and about 2 minutes’ drive from Konnos Bay, a Blue Flag Beach with white sand and turquoise waters offering all facilities you would need for a memorable holiday. Protaras is a more family oriented resort ideal for children of all ages with numerous crystal clear water and white sand beaches, the most famous of which is Fig Tree Bay and Sunrise Beach which are about 2.7km from the Villa or about 5 minutes' drive. Near these beaches is the Central Protaras Strip where most of the hotels, shops, bars, clubs and restaurant are located. In the same area you can find supermarkets, pharmacies, doctors and a clinic. Protaras is a fully-grown resort offering all amenities, facilities and water sports that would make your holiday a great one like Luxury Yacht Charter, Catamaran Leisure Cruises, Undersea Walking, Deep Sea Fishing, Power Boat Safari, Black Pearl Pirate Ship, Water Parks, Aquarium, Gourmet Dining, World Famous DJs, Water Sports, Scuba Diving and much more, Ayia Napa, about 5 minutes’ drive from Villa Sea Star is one of the most cosmopolitan tourist cities of East Mediterranean offering beautiful white sand beaches, turquoise waters and excellent night life. Enjoy all the latest sea sports, challenge your strength and endurance and possibly discover new realms of potential within. Indoor facilities • Air Conditioning • Blender • Cooker • Dishwasher • Filter coffee maker • Free Wi-Fi Available • Freezer • Fridge • Hair dryer • Iron and Board • Kettle • Microwave • Satellite TV • Toaster • Washing machine • Wi-Fi available • Widescreen TV Outdoor facilities • BBQ • Parking • Private outdoor pool • Sunloungers • Table and chairs Services • Arrival Clean • Departure Clean • Linen provided • Optional Extra Maid Service Available • Towels provided • Weekly Clean & Laundry • Welcome Pack Policies Check in: 16:00 / Check out: 11:00 Payment options Visa, Maestro, Mastercard, American Express, Discover, Paypal, Cash, Wire transfer 1. Listed Prices include 250KWh of electricity per week which is more than enough for normal use of the house. Additional electricity consumption is charged at Euro0.30/Kwh. No Bachelor Parties accepted 4. Groups of and average age under 25 years old are not accepted.